The 2016 National Championships will be held once again in conjunction with the 2016 International Grand Prix on the 23rd and 24th April 2016 at the prestigious Grand Master's Suite at the Hilton Malta Hotel. The top placing Maltese athletes in the Nationals will qualify to compete the next day at the International Grand Prix which will have a prize fund of € 5,000. Event info and form downloads can be found here. Top placing athletes in the National Championships will also qualify for the IFBB 2016 European Championships which will be held in Santa Susanna Spain in May 2016. More information will be provided during the AGM. The Malta Federation of Bodybuilding & Fitness (MFBBF) this year is celebrating the 50th anniversary from its inception. To celebrate this milestone the Federation has organised a double event, the 2015 National Championships together with an International Grand Prix sanctioned by IFBB. The weekend kicked off with the 2015 National Championships on Saturday 18th April held at the Dolmen Resort hotel, in which 60 athletes competed in 13 different classes split into five categories, namely Men's Physique, Men's Classic Bodybuilding, Men's Bodybuilding, Women's Bikini Fitness and Women's Bodyfitness. Luke Debono dominated the men's bodybuilding category winning the Junior and Over 90kg classes as well as the Bodybuilding Overall with perfect scores at just 22 years old. Daniel Umanah was the revelation of this year's contest, a first time competitor he won his height class and went on to win the overall in Men's Physique Category. In the women's bikini fitness overall we saw defending champion Derya Satariano challenged by Hannah Tabone Grech. 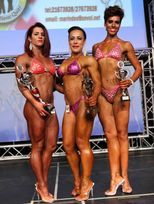 Derya Satariano went on to win the overall title, with Hannah Tabone Grech impressing with her outstanding performance and second placing in her first MFBBF competition. Men's Physique - 1st place Daniel Umanah, 2nd placed Andrew Farrugia, 3rd place Matthew Caruana. Men's Classic Bodybuilding - 1st place Bader Melody Almiloudi, 2nd place Clint Magro, 3rd place Ruben Calleja. Women's Bikini fitness - 1st place Derya Satariano, 2nd place Hannah Tabone Grech, 3rd place Joanne Lewis. Women's Bodyfitness - 1st place Angele Claire Caruana, 2nd place Roberta Borg, 3rd place Stacy Candlish. The top thirty athletes from the National Championships qualified for the International Grand Prix which was held the next day, Sunday 19th April. The Maltese athletes competed against athletes hailing from Ireland, Norway, Czech Republic, Portugal and Italy amongst which world class athletes like Margita Zamolova(Czech Republic) and Cristina Romano(Italy). Luke Debono once again dominated the Men's Bodybuilding category, remaining largely unchallenged, obtaining a perfect score in the overall with the the Irish competitor coming in in second place. The Women's bodyfitness category was won by World Champion runner up Margita Zamolova, closely followed by another world championship finalist Cristina Romano. The men's classic bodybuilding category saw the battle for top placing between the Norwegian and Maltese athletes with the Norwegian athlete winning by only a few points. Women's Bikini Fitness - 1st place Derya Satariano, 2nd place Hannah Tabone Grech, 3rd place Joanne Lewis. All 3 athletes are Maltese. 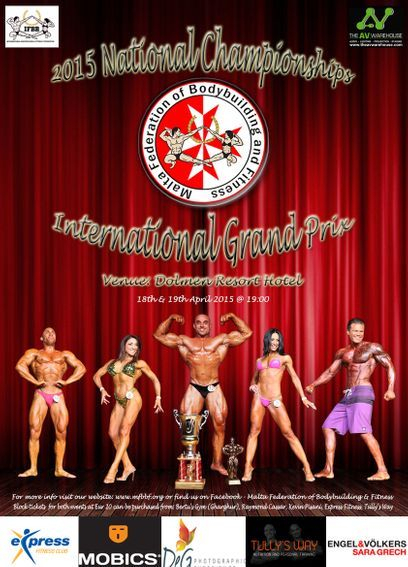 The Five Overall National Champions will also be representing Malta in the IFBB European Championships which will be held in Santa Susanna Spain between the 13th and 18th May 2015. Ten days away from the 2015 National Championships and International Grand Prix and events are almost sold out! Sixty seven athletes will be competing for the titles of National Champion in their respective categories on Saturday 18th April 2015. Last few tickets are available from Bertu's Gym Gharghur, Express Fitness @ Soreda Hotel, Ray Cassar (Challenger) and Body Masters Health Shop. Get your today before they run out! 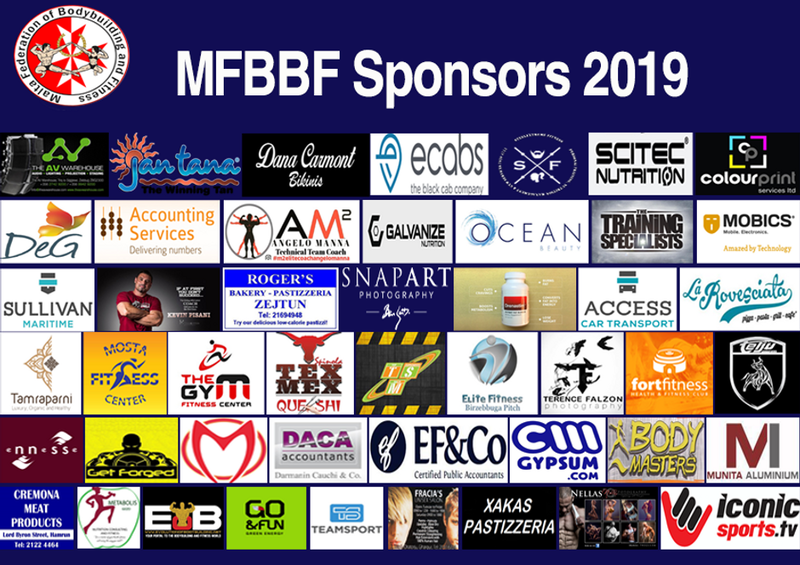 This year our Federation is celebrating its 50th Anniversary, to mark this milestone in the history of bodybuilding in Malta, MFBBF is organising a two day Bodybuilding and Fitness Extravaganza at the Oracle Suite, Dolmen Resort Hotel. The 2015 National Championships will be held on Saturday 18th April 2015 starting at 19:00. The first two athletes placed in each height or weight class in the seniors categories will go on to compete in the category overall where there will be more than one class in a category. The first three athletes placed in each height or weight class in the seniors categories will qualify to compete the following day in the International Grand Prix. The Overall winners of each seniors category will also qualify for the IFBB European Championships which will be held between the 13th and 18th May 2015 in Santa Susanna, Spain (provided that a given category has more than three competitors). Tickets at € 20 for both events are on sale from Tully's Way (Paola), Kevin Pisani (Bodymedics Fitness Centre Zejtun), Bertu's Gym (Gharghur), Express Fitness (Soreda Hotel Qawra), Raymond Cassar (Challenger Qormi), Mobics (St Paul's Bay), Bodymasters Health Shop (Paola), Gymnasia (Paola) and Derya Satariano (Sliema/St Julians). The Malta Federation of Bodybuilding & Fitness on behalf of its members expresses its deepest condolences to President Santonja and his family for the loss of Señora Mercedes. May she rest in peace and her family find comfort in this difficult time. Those athletes who still have to settle their membership and contest registration can hand in their forms and payment on the 28th February 2015, from 14.30 till 15.30 at Bertu’s gym. Deadline for contest registration 18th March 2015, late applications will not be accepted. Athletes wishing to order their contest tanning please do so by Saturday 22nd February 2015. IFBB International Austrian Championship 2015, organised by IFBB Austria. Athletes wishing to compete in the event are to submit their request to MFBBF Committee by not later than 05.04.2015. 01.02.2015 The new MFBBF website goes live on-line! Following the drive to give more visibility to our Federation, the Committee has decided to close the old website and develop a new site. The committee has evaluated the needs and suggestions of its members and the general public and has come up with a site which offers all the necessary information needed by prospective competitors and the public in an easy to navigate format. The site will be updated regularly so register your email to receive updates. The Annual General Meeting was held today at Bertu's Gym in Gharghur. - the Committee elections for the two years 2015 to 2016, Ralph Decelis was reconfirmed as President, Blanche Coppola as General Secretary, Trevor Taliana as Treasurer, Antoine Micallef and Marc Mizzi as committee members and Kelly Blake was elected as committee member. - following directives from IFBB, a proposal to change the Federation's name to Malta Federation of Bodybuilding & Fitness was discussed and approved unanimously by the members present at the meeting. - the 2015 National Championships and International Grand Prix will be held on the 18th and 19th April 2015 at the Dolmen Resort Hotel. Categories in the National Championships will be Men's Athletic Physique, Classic Bodybuilding, Bodybuilding, Bikini Fitness and Bodyfitness. - Qualifications for International Events, the top three athletes in each height and/or weight class during the National Championships will qualify for the Int. Grand Prix which will be held on the 19th April 2015. The overall winners of each category during the Nationals will also qualify for the IFBB European Championships which will be held in Spain between the 12th and 17th May 2015 (qualification is subject to having more than three athletes in the respective category). Athletes wishing to participate in IFBB international events can request approval in writing to the MFBBF committee and must have competed in the National Championships.